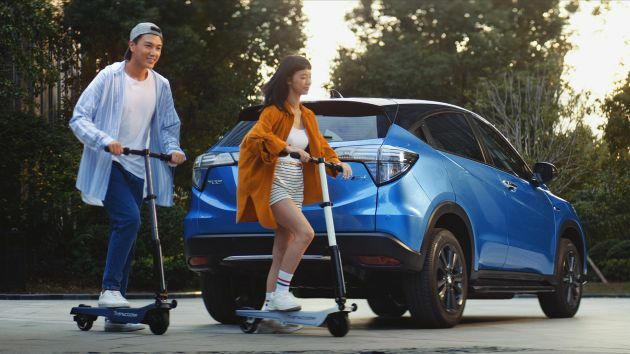 Honda, together with its Chinese partner Guangzhou Automobile Group (GAC), has launched a new all-electric crossover at the Guangzhou Auto Show called the Everus VE-1. 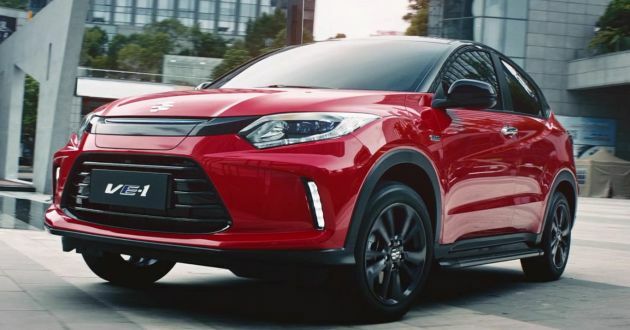 The China-exclusive model was first previewed by the Everus EV Concept several months earlier, and is similar in size to the well-known HR-V. In terms of styling, the VE-1 differs from the HR-V with its revamped front fascia which includes vertical LED daytime running lights that flank a trapezoidal-shaped lower intake. The chrome bar placed between the headlamps is now gone, and the grille section is largely featureless save for the cover over the charging port. Beyond that, the rest of the EV is almost identical to the vehicle it is based on, including the design of the rear-end and interior. Focusing on the latter, you’ll notice a button-type gear selector instead of conventional lever, as well as a new instrument cluster to reflect the zero-emission powertrain fitted. On that mention, the VE-1 is motivated by an electric motor that outputs 161 hp (120 kW) and 280 Nm of torque. The motor is linked to a single reduction gear that drives the front wheels, allowing the EV to accelerate from 0-50 km/h in five seconds and on to a top speed of 140 km/h. A 53.6 kWh battery provides power to the motor, and provides up to 340 km of range on a single charge and 430 km at a constant 60 km/h. The VE-1 connects to a charger via a Type 2 connector but detailed information in relation to charging isn’t provided. Based on what we can gather from the official product site, the “standard charging time” is nine hours, or 55 minutes when fast charging is used. Equipment-wise, the VE-1 comes with 17-inch wheels, LED headlamps and taillights, a panoramic sunroof, keyless entry and start, single-zone automatic air-conditioning, leather upholstery and an eight-inch touchscreen infotainment system. You’ll also get three driving modes – Normal, Sport, and Battery Saver. The VE-1 is priced at 170,800 yuan (RM103,015) but this including incentives; without them, the EV retails at 225,800 yuan (RM136,186). As a comparison, the normal HR-V (known as the Vezel there) starts from 128,800 yuan (RM77,683) there. Interested? Cheaper than the ICE version here. Bye bye ICE cars. Meanwhile Proton still tidur. They announced Iriz EV 5 yrs ago and Hybrid 10 years ago. We are still waiting…. Toyota hybrid RV even worse than a P1. Can find a Prius in mudah for Rm30k. Same year Preve also selling for RM30k, but ori price diff was 2X! I want to buy local made Proton EV but too bad for me, no EV from Proton. MAI still sleeping. Cause MAI is the one that told us country is moving towards EV 7 years ago. Until now, how many EV that we got that is affordable? Proton showcased their Iriz EV 5 years ago. They said the EV will be better than Tesla. 340km range is comparable to bmw i3, chevolet bolt , nissan leaf. Meanwhile Toyota still sleeping with their overpriced CHR. Electrification? Yeah right. P1 how big, Toyota hwo big? Isnt that stupid to compare both? So when is ur Toyota coming out with CHR EV? Ur Jepunis lords still sleeping goyang kaki kah? But but but why toyota no sell mirai here? Toyota still makes money whilst our Proton is losing money. Big difference. Dun bring ur dupe with stupid reasoning and lame excuse to involve unrelated P1. And Toyota is losing sales & market shares esp with Trump tarriffs. Again, dun bring dupe stupidity to reply me. Poor you. Head stuck in sand. But so far only Camry hybrid enters Malaysia due to tariff & low demand. See other comments saying hybrid have battery problem. Haha. Unlike China (Monopoly of rate Earth),, Japan have limited resource, and need to source lithium at higher price. This, uneconomical for Japanese use. (1 EV battery = 40 HEV battery). Get that head out of the mud. Still prefer plug in hybrid than pure electric car. 340km is better than many electric cars but still unable to support from north to south. Solid wing face is gone! BRING MORE EV BELOW 100k TO MALAYSIA PLEASE!!!! HM should’ve brought in this instead of the RS which is just another facelift. Anyways the government should change policies pertaining EVs & let em in Msia. So basically the whole body and chasis is already in Malaysia, only missing the electric motor locally sourced then become Malaysia’s 3rd national car? No? When you refer EV and Toyota do not forget Malaysia because Toyota is one of the forerunner in EV technology remember Toyota Prius, yeah ages AH!. Gerard, I believe VEZEL is Hybrid with 1.5L engine. HRV is pure ICE. VEZEL is the JDM name for HRV. It comes in either hybrid or ICE versions (wiki/Honda_Vezel). Keep urself updated.